Thinking about Raffe returning home also calls to mind a ton of unanswered questions that I have about this series. Are Raffe and the other angels actually from the Christian heaven and if not, where the hell are they from? Where are all of the female angels? Layla who is redeemed off page when she helps Raffe get his wings back and fixes whatever the hell wrong with Paige, is totally the smurfette of the angels. This makes me wonder how the hell these angels are related to each other and how they came into being? We know virtually nothing about the Angels' society or where they belief system comes from. To make matters worse, except for a few key people namely Uriel and Raffe's small little band of fighters, they all have one personality. I suppose knowing so little about angels is meant to make the reader not question the motivation behind the actions of Michael and Gabriel but it had the opposite effect on me. First off, we have Michael, who doesn't want the job of Messenger. He stayed wherever the angels came from even after Gabriel was murdered and Uriel began his fake apocalypse, killing millions of humans. Nope, Michael was absolutely content to do paperwork. Are we really supposed to believe that the same being who wouldn't take the job of Messenger before is suddenly going to be inclined to do so if the angels hunt him down? On to Gabriel. What exactly where his motivations for leading the angels to earth in the first place? What's his deal with the whole Daughter of Man is an evil corrupting temptress? It's biblical sexism folks and never really gets explained. Why exactly does Gabriel believe the nephlim are evil? Why did he lie about hearing messages from God? Who's running the universe anyway? I love that Paige became the leader of the locusts. Unfortunately, she kind of had to in a sense because Penryn was far to fixated on Raffe throughout the story to pay her little sister much attention. That's not to say however that Penryn didn't occasionally notice that her sister was starving to death, it's just that the nurturing relationship they had in the first book really seemed to disappear. This certainly is not a good thing because it serves to isolate Penryn making her the long woman amongst the men. Yep, she's damn near a smurfette. The only other female character in the End of Days is Penryn and Paige's daughter and she still doesn't have a name. Given that the character in question is the only mentally ill person in the story, a lack of a name is an issue. Penryn's mother will do anything to see her daughters safe. If it means breaking into an angel stronghold and setting it on fire, she's more than eager. She is strangely competent and manages to take a leadership position throughout much of the book, though quite a bit of it is off page. For much of this series, Penryn has seen her mother as a burden and is alternately embarrassed by her mother's escapades. It's this nameless character whose sole goal it is to see her children survive who seems the most capable of all. My mother hasn't asked the questions that a normal person would ask, and I'm grateful for it. It's like the world has become so crazy that it makes sense to her now. So, it's her illness that turns her into a magnificent super crip. Yeah, I'm not sure exactly how I feel about this. I wanted this book to epic. I was more than ready to believe that the problem with World Effort was that Ee was trying to get her ducks in a row for a big finale. Instead, by the End of the Days I had trouble remembering what drew me to the Penryn & the End of Days series in the first place. Penryn is a selfish protagonist whose inner monologue is so vapid it calls into mind Anastasia Steele of E.L. Jame's 50 Shades of Grey. I know that Penryn is young and virginal but having her go on about how perfect Raffe's body is, how his wings are fluffy and how sensuous his lips are grew tired fast. Though Penryn has technically aged from the first book her character is written much younger than even in the first book. A character should move forward and not regress. 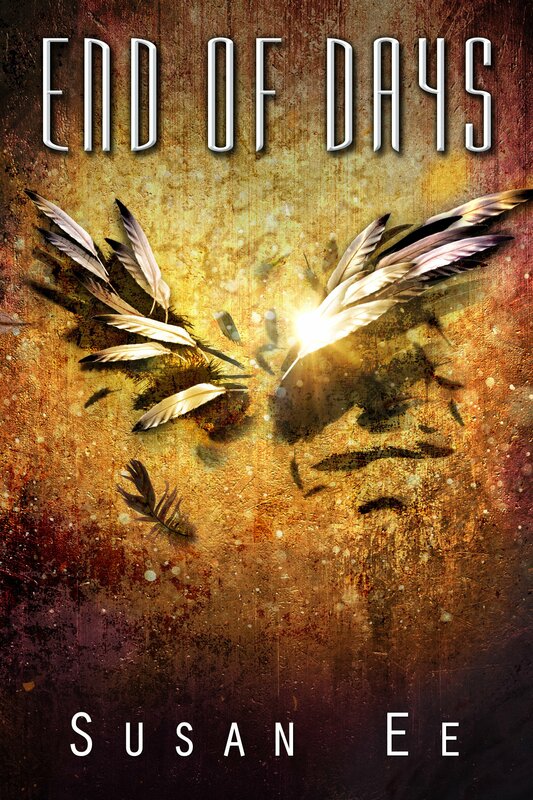 End of Days is just filled with plot holes, empty characters and a forced HEA. It reads like typical YA with nothing to set it aside from many other books in this genre. It left me asking where did my wonderful series go? It's as different from Angelfall, (the first book in this series) as night is from day. The characters haven't grown and are no longer likeable. Even Tweedel Dee and Tweedel Dum weren't remotely amusing. End of Days should have been so much more, if only Ee had not clung to the notion that there's only way a YA novel has to end - HEA. If I had known that End of Days is how the story would be wrapped up, I would have avoided the entire series to begin with.